Land/seascapes of a world that I saw through the photographic lens at the coasts in Athens, Piraeus, West Attica and Corinth. 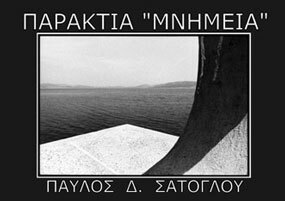 The album Coastal "Monuments" contains 38 selected photographs (black & white, size 18.7x12.6cm), which have been shot by Pavlos Satoglou, from 1996 since 2003, at the coasts between Varkiza and Corinth. An audiovisual projection (slide show, multimedia etc) is the result of the engagement of two arts, cinematography and photography. It isn't cinematography because there is no metikasma. It isn't photography because the pictures stop being individual works, they depend on the picture that follows and the one that precedes. 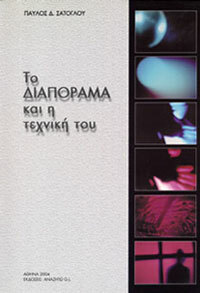 Although slide shows are used extensively in informing, in education, in artistic expression, although their technique has being taught at many greek schools and universities, the relative bibliography is almost inexistent. This non-existence along with the fact that all the times that the relative lesson has been taught at public Institutes of Professional Training (IEK) in Attica, always was used the pre-notes from which the book made (which was highly commented many times by the students and the teachers who used them), imposed the necessity to publish this book. In the book introduced and analyzed all the components that can lead to the making of slide shows and also the way that they react each other during the making of the slide show until its presentation. It describes not only the classic technology from which slide shows were used to make but it also presents the digital technology that already started to win films and lap dissolve systems and in the near future will be the common way of making slide shows. In this paper, it is attempted the specification of the changes which happened in the 20th century (when and by who, on which timeline, what is the present situation) and they have to do with the relation between the work of art and the city, the artist and the viewer, and with the definition of a work of art. In the chapter of the historical retrospection, the time, when the changes occurred, was located in the active period of the Internationale Situationiste (circa 1960). The prominent avant-guard movements (Futurism, Dada, Surrealism), that prepared the soil for the situationists and the way they did it, were also studied. These changes were specified (art finds its place in the everyday life and makes use of its potentiality to intervene, the roles of the artist and the viewer are confounded and interchanged, the work of art is unhooked from material, temporal, commercial limitations and it can be a result of the combination between arts or a result of detournement) and the artistic fashions of happening and street-art were studied, as indicative samples of movements which were active the same period with the situationists and a subsequent period, respectively. Their research has shown that the happened changes were a need of that time and that they were accepted from the subsequent artistic movements and the instituted art world, as well. In the chapter of the case studies, two recent projects were presented, taken from the field of street-art, the "28 Millimetres", by JR (it is about open-air exhibitions of photography, in a variety of cities) and the "EyeWriter", by Graffiti Research Lab (it is about the construction of a system which allows the paralyzed ones to write tags on a computer, with the use of their eyes, and their screening in city walls). Their analysis has shown that although these projects have references to previous works, they follow the changes, mentioned before. In addition, the existence of similar projects, which were happened the same period, has shown that this kind of events are a fashion of the present era. The analysis has also shown that the use of technology is increased, leading to new ways of artistic expression, like "eye-art", and aiming to the wider participation of the people. Finally, their wider acceptance (participations in art-festivals, awards etc.) confirms that the occurred changes have been accepted completely.